Everything starts very early. The moon is on the sky shaped in the same way as the Turkish flag. Flying with balloon is magic, quiet and you feel peace while the day starts. It was a cold morning in the middle of the Turkish peninsula, in Göreme, the heart of Cappadocia, the land made of sculptures and where the people lives underground. One of the typical and unforgettable activities that everyone must do in Capadoccia is a Balloon flight. The day starts driving a 4×4 between canyons and strange rock formations under the moonlight. At some point the driver stops and you see the balloon flyers stretching the deflated ballons in the fields. Then you hear a strong noise from a gas engine, burning gas to heat the air at the mouth of the balloon. In the darkness of the early morning, burning gas of different ballons at the same time look like a dance of flashes. Then, when the ballon stands by itself the flyer asks you to jump into the basket. Then prepeare your ears for the noise of the engine in full mode. And when the air density inside the balloon is lower than the air outside, like magic and in a soft way, the cage starts floating. The sun starts going up at the same pace as the balloon. It is maybe the most magic moment, surrounded by dozens of balloons and all together whatching the sunrise. Without any doubt one of the best sunrises you can see in the world. The colors and the shapes of Cappadocia start shining beneath the balloons. Everything looks like a quiet party. When you are high enough and the engines are off, the silence surrounds you and only a distant sound of other balloon engines can disturb you somehow. It is the moment to look 360º, take photos and videos. Ssssssh Don’t say anything. Keep quiet. No words. Just the breeze. And at some point we started descending and flew narrowly by the rocky walls. We spotted a fox, which didn’t look afraid surrounded by balloons. And then the landing. This is definetely not quiet, smooth and peaceful. The flyer tries everything to make it as slow as possible, as soft as possible, but at the end you crash against the field and the basket spin while the balloon starts to desinflate. The only way of going out was by crawling while laughing. The experience was fantastic and we still had a cup of champagne and some typical turkish sweets. Can you see the windows on the rocks? What an amazing experience, this is definitely on my bucket list. I have never done a hot air balloon ride and I think Cappadocia is an ideal place to do it. 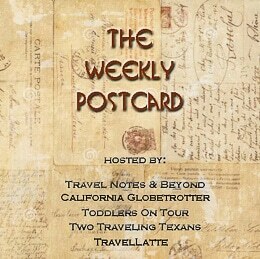 Love the pictures, thanks for sharing on #TheWeeklyPostcard. Wow lucky you! I still haven’t ticked this one off of my bucket list! I didn’t imagine it would be loud though! And I often only see pictures of people watching the balloons rise, not from actually in the basket! Thanks for linking up with #TheWeeklyPostcard! It is always great when we can help to recover memories from old travels. 😊 Thanks for your comment and glad you liked the photos!